It’s the end of the week, and we’d like to go out on a sweetly upbeat number, so here it is: It’s been a number of years now since the age of outrageously over-produced spectacles involving marriage proposals began. While it results in the occasional good one, mostly it means far too many YouTube videos of groups of friends dancing around to loud music while some guy busts a move from High School Musical and then holds out a ring. Well, 30-year-old Alec Wells bypassed all of that by going straight to the most romantic idea he could think of—namely, a masked, psychotic serial killer. Wells’ girlfriend Katherine is apparently a massive fan of horror cinema, and so a visit to the original street where John Carpenter’s Halloween was filmed prompted him to act. It’s unclear whether Katherine was just planning to do a fun reenactment of the scene where Laurie sees Michael Myers while walking with her friends, or if they were trying for a more ambitious project during their outing. 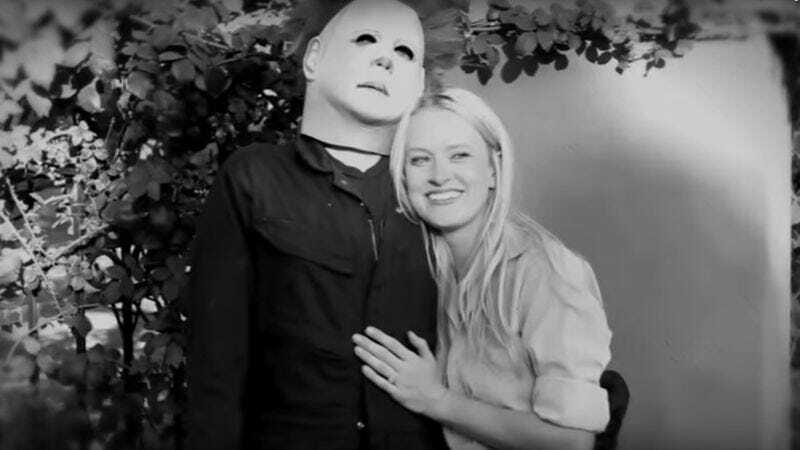 Regardless, despite the idea that one of horror’s most iconic killers getting down on one knee might be a little weird, the result is really quite sweet. We were always rooting for Laurie and Michael to make a go of it, subsequent reveal of the sibling relationship aside.